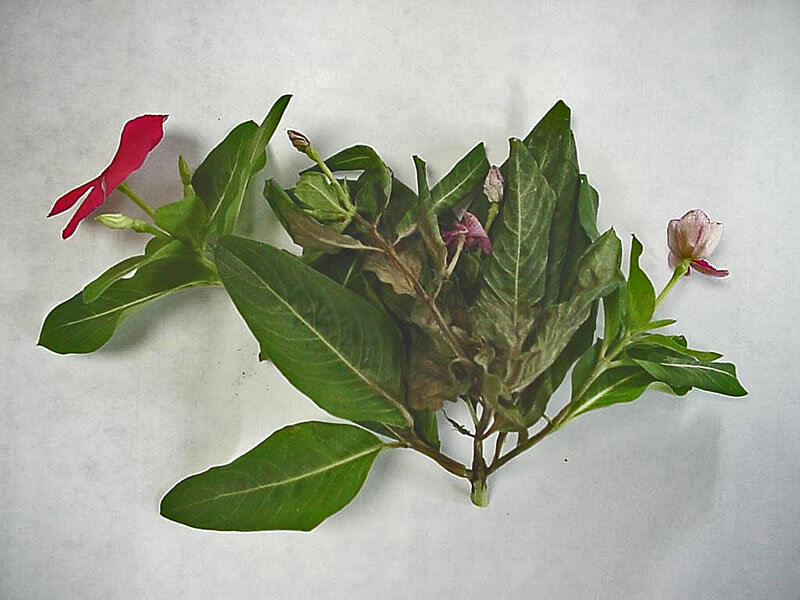 Question: What does the annual Vinca/Periwinkle plant look like once it has been infected with the Aerial Phytophthora fungus and is there anything you can do to help once you have the fungus? Answer: As can be seen from these images, the stem turns black and the plant above the lesion will gradually die. 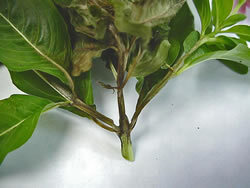 When you see this symptom on a plant you should remove it from the bed and discard it in the garbage. 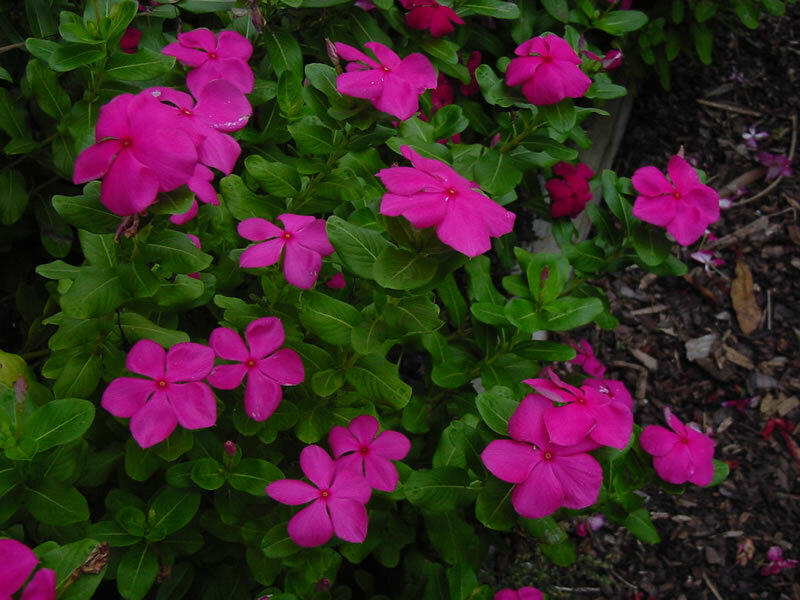 You should not plant the Annual Vinca/Periwinkle until the weather gets hot (late May - June); you should mulch around the plants to help prevent the soil particles where the disease is residing from splashing up onto the plants; and you should water the soil and never the plants. From: http://www.plantanswers.com/Phytophthora.htm Annual Vinca (periwinkle): If full sun conditions prevail, periwinkle can be used. It will also perform well in partial shade. 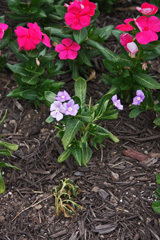 Annual Vinca (periwinkle) should not be confused with the perennial groundcover of the same name. Flowers of pink, white or violet are often highlighted with a contrasting red eye. This is one of a very few annual flowers which the deer won't destroy. QUESTION: Is the fungus that infects the annual periwinkle plant specific to the annual periwinkle plant only? Once a bed is infested with it, does the fungus remain in the soil forever? Well, maybe not forever, but for several years. Are there precautions that should be taken for other plants in the same bed such as trees and shrubs. ANSWER: Most other plants should be okay. 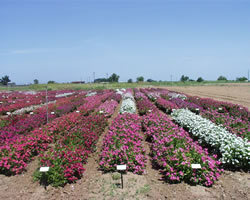 Potential problems might develop with other bedding plants such as snapdragons, stocks, petunia, pansy, viola, etc. However, Phytophthora fungi are most happy if soil is waterlogged due to planting in a well, over watering, poor surface and internal drainage, etc. Therefore, amend soil, throw up mound/berm, and water in moderation, avoid sprinklers. There was a paper at the August, 1999 APS meeting on this based on work in Hawaii. They found that at least three Phytophthora species infected periwinkle, all with similar symptoms. Their most common species, and what we see most often in Texas, is P. nicotianae. NOW!!!! Are you ready for a minor miracle? Are you ready for another *break-through* thanks to a Plant Pathologist Specialist at Texas A&M University working for the Texas AgriLife Extension Service? Well, whether you are ready or not, a big one has happened!! 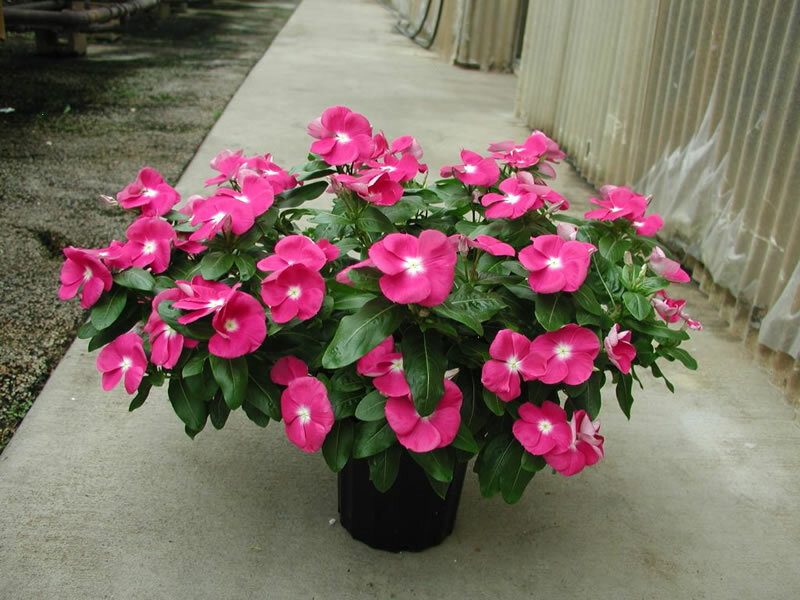 For about 10 years now, everyone was scared to death to plant annual Vinca (Perwinkle) because of the plant-killing disease named Aerial Phytophthora (fungus - Phytophthora parasitica): The infection is generally characterized by leaf blight and upper stem deterioration. Infection is distinctly an aerial problem, not involving lower stem and root tissue. In most cases, leaves are shriveled and dull-gray in color. An aerial sunken stem canker can also develop. Symptoms develop rapidly in outdoor planted beds, especially during conditions of prolonged, rainy weather. This is a soil borne fungal disease that, once in the plant, will eventually kill the entire plant. There is no cure for it. There are, however, some preventative measures that you can take to help prevent it. First, annual periwinkles should not be planted until the soil and air temperature get quite warm. It is normally recommended that you wait until the last of May - first of June to plant them. Secondly, you should place mulch around your plants to help prevent the splashing of the spores up on the plants. And lastly, the plants should be watered from the bottom using drip irrigation or a bubbler emitter on your sprinkler system. NOW!!! FINALLY!!! You can reap the rewards of a deer-resistant, disease-resistant, shade-or-sun exposure, summer-through-fall, spectacular blooming annual. Here is the story. 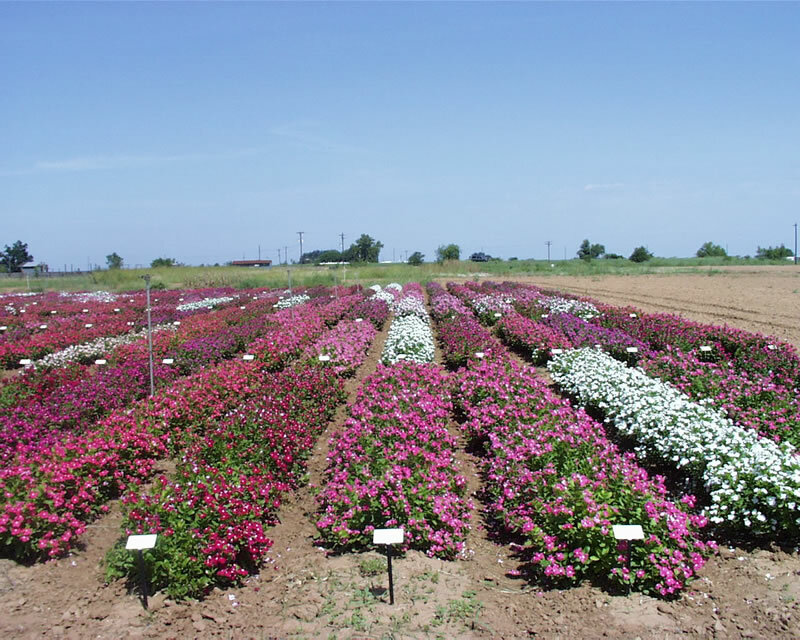 In the spring of 2007, Dr. Brent Pemberton, Texas AgriLife Research horticulturist working at the Overton Center, provided the Texas SuperStar plant evaluation team with sample plants of annual Vinca which he said were disease resistant. Dr. Jerry Parsons, Texas AgriLife Extension Service horticulturist in San Antonio was skeptical to say the least. Dr. Pemberton even wanted to provide a check variety which was known to be highly susceptible. 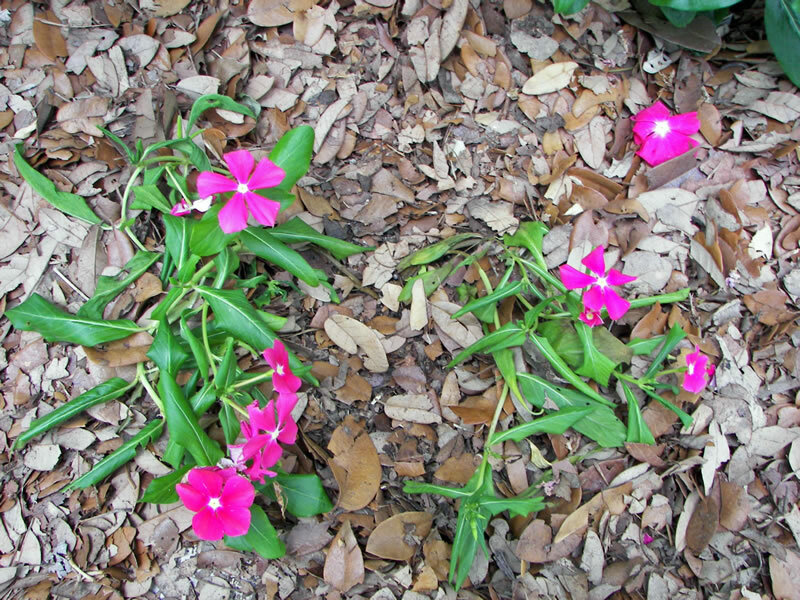 Parsons explained to him that if it could live a month ANYWHERE in San Antonio, it would be a breakthrough-he didn*t need a check variety because every annual Vinca/Periwinkle in San Antonio suffered from the disease. Forrest Appleton, the famous deer-handler (i.e., keeping deer from eating every plant in the landscape! See: http://aggie-horticulture.tamu.edu/plantanswers/publications/deerbest.html) of Hollywood Park had expressed an interest in trying to plant some more annual Vinca/Periwinkle in an area which had not had the disease-thinking that would prevent or lessen the disease pressure on the plants. He had several beds which were heavily contaminated from past years of planting annual Vinca/Periwinkle. The reason everyone with a deer problem desperately need annual Vinca/Periwinkle is that (1) deer will not touch them, (2) the plants do well in semi-shade or full-sun, and (3) many colors are available and the plants will bloom profusely until the first hard frost after planting in June.--- 6 months of beauty!!. The results were UNBELIEVABLE!!!! During the fourth wettest spring and early summer in San Antonio weather-keeping history! !, not a one of these plants died of the disease. These plants were planted in the contaminated beds rather than *clean* beds. The deer walked all around the flowers and did not touch a one! 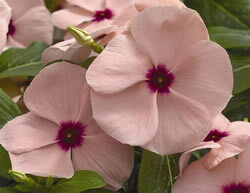 Brent Pemberton then corresponded with Ryan O*Callaghan at Goldsmith Seed Company about *Cora* annual Vinca/Periwinkle. He said: *The *Nirvanas* were introduced first as a vegetative line because they could be put on the market faster than developing a seed strain. The *Cora's* are the seed strain from the *Nirvanas* which still have some novel colors and plant habits. Two new *Cora* colors will be introduced this spring (*08). *Cora* is named after Cora Van Wingerden - the matriarch of one of the largest horticulture families in the country. 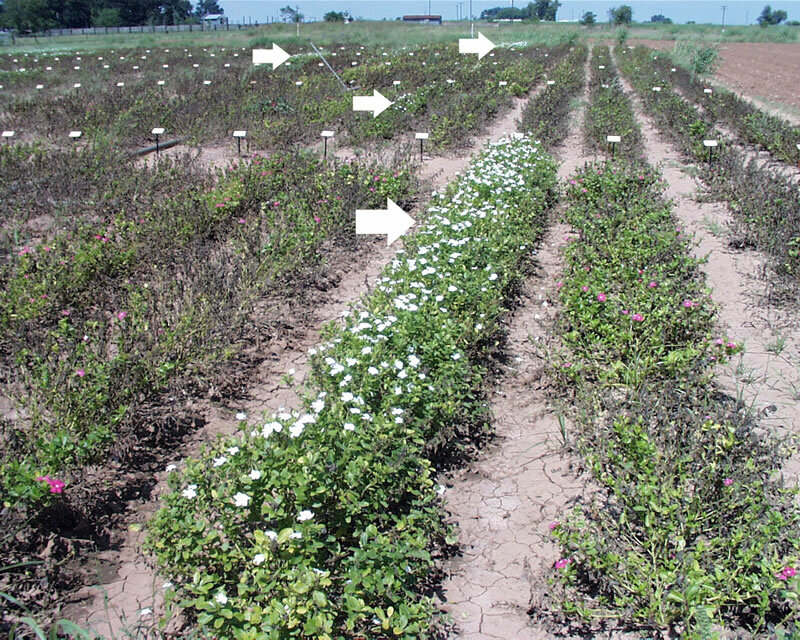 Parsons writes: Concerning the annual Vinca/Periwinkle, guess where the resistance of this line was first tested?!?!? At College Station, Texas, working with Dr. Larry Barnes at Texas A&M University!!! Larry was working with Dr. Darrell Thomas, plant pathologist at Goldsmith Seed. 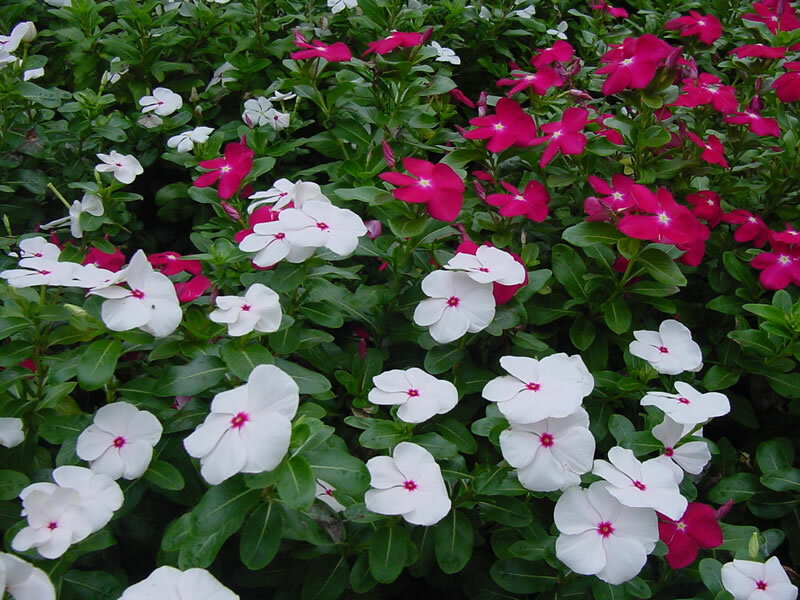 ALL of the so-called *resistant* varieties of annual Vinca were planted side-by-side in a randomized, replicated (six reps) design-this simply means all of the annual Vinca varieties being tested were randomly selected and planted side-by-side in each of six different - yet adjoining-blocks. This type of planting insures no coincidental findings, i.e., if a variety performs the same in ALL four blocks, you can be more assured of the results. This image shows the planting in its full glory!!! EVERY ONE of the inoculated varieties DIED except ONE!! A single, white selection which had resistance was identified in EVERY block-see red arrows in the last image. 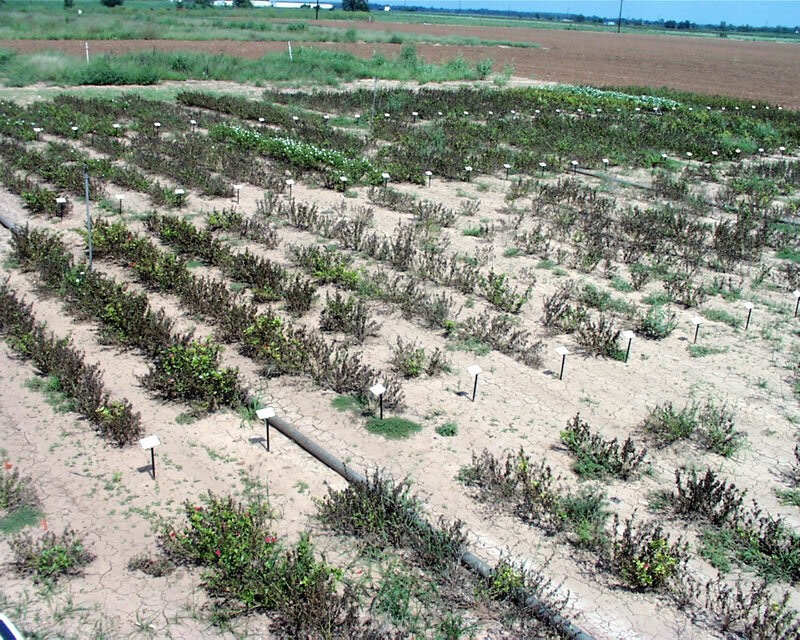 The following image shows the ONLY survivor (that white one next to the DEAD ONES) in these replicated plantings. Stands up to heat, humidity, and rain beautifully, and blooms heavily all summer. A Breakthrough in Disease Resistance! 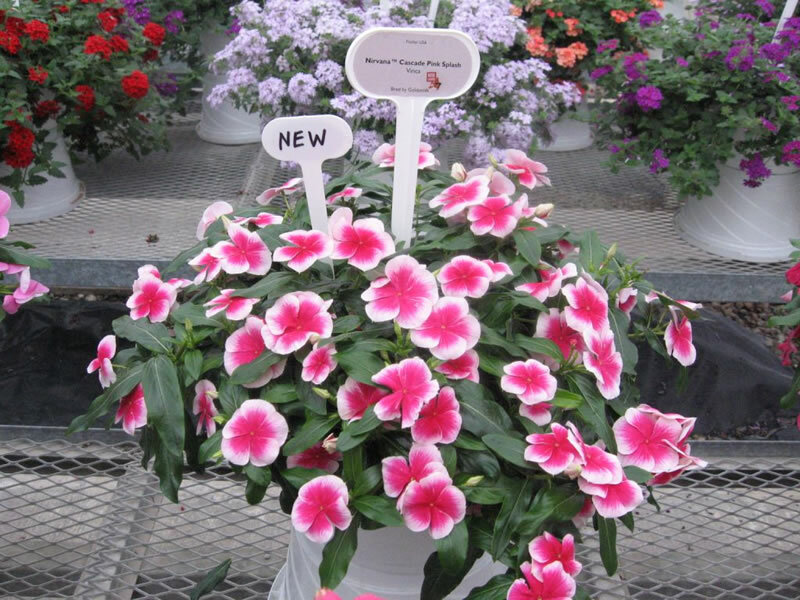 No More "Sudden Death" Annual Vincas! This new Annual Vinca has been two decades in the making, the disease-fighting technology developed for it is so revolutionary that it's actually patented! 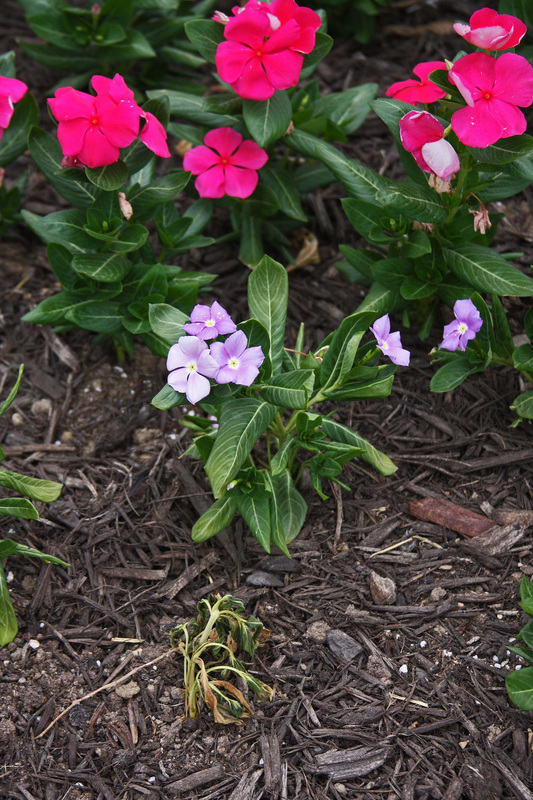 Until now, Annual Vinca has been prey to "sudden death" in humid, rainy, or very hot climates. Now the cure has been discovered, and Cora* is ready to thrive in the most damp and moist conditions without turning a petal! It's a whole new day for this lovely, long-blooming plant! 'Cora'* Apricot is a very well-branched, heavy-blooming plant about 14 to 16 inches high and 25 inches wide. The blooms are a bright shade of apricot starred with a darker center, and they appear right down to the ground. Flowering heavily all summer (and sometimes in late spring and early fall as well! ), this plant is eye-catching and very, very easy to grow. 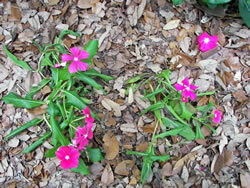 'Cora'* was the only Annual Vinca to survive until frost in punishing garden trials in Dallas. After all the freak hot spells and cold snaps of autumn, it alone remained in the garden, briskly growing! This is a plant that can take climate stress of all types in stride. In addition to Apricot, there are 7 other single colors: Burgundy, Lavender, Deep Lavender, Pink, Punch, Violet and White. 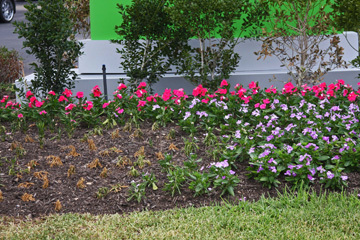 Each color has the same height, width, and bloom time as the others, so they do very well in large mixed plantings. Sun/Part Shade; Height: 14-16 inches, Width: 25 inches; Summer Give Cora* full sun and good soil drainage. It is useful as a bedding plant, border standout, ground cover, and even in containers indoors and out! *Cora* seed is available from Park Seed Catalog. Click here for more information. I TOLD YOU TO PLANT ONLY "CORA" VINCA-PERIWINKLE!!!!!!! seemingly healthy plants on right. The dead Vinca in front; the declining plant- blue- behind; look-healthy, soon-to-be-dead plants in background.